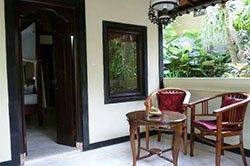 Sama's Cottages & Villas is a peaceful and relaxing retreat in Ubud, yet is located just a 5 minute stroll from the centre of town. 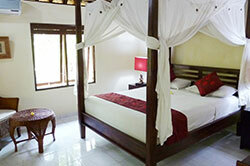 The property has just 10 individual cottages, all refurbished to make your stay more comfortable. The friendly staff brings your breakfast to your veranda each morning, or alternately you may eat by their lovely pool if you wish. 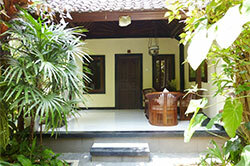 Sama's Cottages has a beautiful Meditation & Relaxation Bale at the foot of their verdant property. 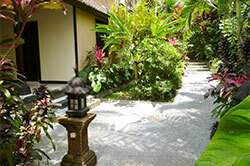 You can meander through their ambient gardens, descend to the bale and enjoy the peaceful surrounds.